Fighting crime has never been so rewarding! 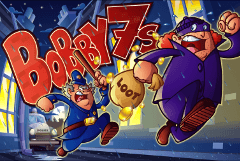 The Bobby 7s slot machine has been developed by NextGen Gaming and sees you take to the cobbled streets of London to chased down thieves with your wooden truncheon and give them a good battering before nicking them just like in the olden days, with big rewards on offer for every criminal you can put behind bars! The term ‘bobby’ referring to police actually originated back in 1829 when Home Secretary Sir Robert Peel created the London police force and the reels of Bobby 7s sees us travel back in time in our vintage police cars as we chase down thieves late at night. It’s a 5-reeled slot machine containing 25 paylines that can be adjusted and it is filled with bonus features – including a Hi/Lo game that can see you win up to 500x your stake! An old bobby on the beat is the Wild symbol with the rights to substitute for all standard symbols on the reels, plus he earns respect by being the most valuable symbol on the reels with five on a payline resulting in a 100-coins win. As good as the prizes are, I especially love the bobby appearing because he is always in a fit of anger sprinting after a thief with his wooden truncheon as his hat bobbles up and down! There are a variety of special symbols to look out for on the cobbled streets too with the masked thief making his escape acting as the Scatter symbol, plus there is a trio of 7’s on the reels with police, crook and judge versions which all have bonus features associated with them. A variety of delicious fruit that you’d expect to find in online fruit machines also feature on the reels of Bobby 7s with watermelon, strawberries, plums, oranges, lemons and cherries to sink your teeth in after a hard day’s work on the beat! It’s time to put your running boots on whenever you see a thief appear on the first, third and fifth reels as you’ll have to give chase to stop them in their tracks, with lots of free spins to enjoy as a reward for catching the culprit red handed. This free spins bonus feature randomly awards you up to 20 free spins, and while you may only receive single figure numbers of spins in some cases, the fact that free spins can be re-triggered makes it plausible to keep spinning the reels for free, plus any wins you enjoy are doubled in value – working up a sweat to catch the crims is certainly worth it! Whenever you hear the loud sirens ring out with the Police 7 symbol appearing on the first, second and third reels you’ll be climbing the ladder to riches in a sensational Hi/Lo bonus game that will remind you of the Play Your Cards Right TV show in which Fremantle have developed a slot based on. You’ll simply guess whether the next number to be revealed will be higher or lower than the previous in a series of ten, with each correct guess moving you up one step, with the highest prize being worth 500x your bet – but be careful as an incorrect answer sees you slip and fall off the ladder! Getting the Crook 7 symbol on the third, fourth and fifth reels triggers this quick and simple mini game that requires you to select one of the three symbols to receive a cash reward, with prizes of up to 40x your bet to enjoy. This is a fun little bonus game which begins once you land the Judge 7 symbol on the second, third and fourth reels during the same spin. It sees you in court to watch the thief that you’ve caught be punished, and each slam of the hammer the judge makes means a longer sentence and bigger rewards for you, with up to 5x your bet on offer for bringing the crook to justice! It’s time to grab your truncheon and get on the beat as a bobby to rid the town of criminals. Bobby 7s has proven to be major at hit at the best online casinos for UK players and it’s no surprise due to the quirky theme, the funny animations as you land winning combos, and the plethora of bonus features that have been packed into it which never fail to reward you with big wins for serving your community!